For those who don’t know me, I live in Emmetsburg, IA. Emmetsburg is the sister city to Dublin, Ireland, and a town of about 3500 people. I have been here for almost 21 years now and am pretty much still an outsider. Those of us who grew up elsewhere and moved to Emmetsburg call each other “transplants”. The Irish families run deep in this town and they have continued the St. Patrick’s Day celebration each year since 1961. You can read a brief history of the celebration on the Emmetsburg St. Patrick’s Association website. Here is a quote about how the parade got started. One of these customs was observing the feast day of Ireland’s patron saint. With the passage of time the ritual lost most of its importance until 1961. A group of Irish lads, believing “no one loves a parade more than the Irish”, donned green derbies, carried their coat of arms and marched proudly through the main thoroughfare of Emmetsburg, on March 17th, the feast day of Saint Patrick. This is large celebration in our town and is compared to Christmas because families usually come home to visit for this holiday. I can tell you…I have not seen this many people in town at Christmas. One year we were even listed in this article on The Street as one of the 10 surprising places to celebrate St. Patrick’s Day. Why am I telling you all of this? 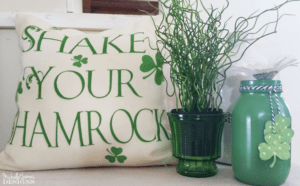 Well, so you will understand why, for the next few weeks, 90% of the crafts, DIY and home decor on my blog will be green and full of shamrocks. It is a quirky little town but I have to say they know how to have fun in March! 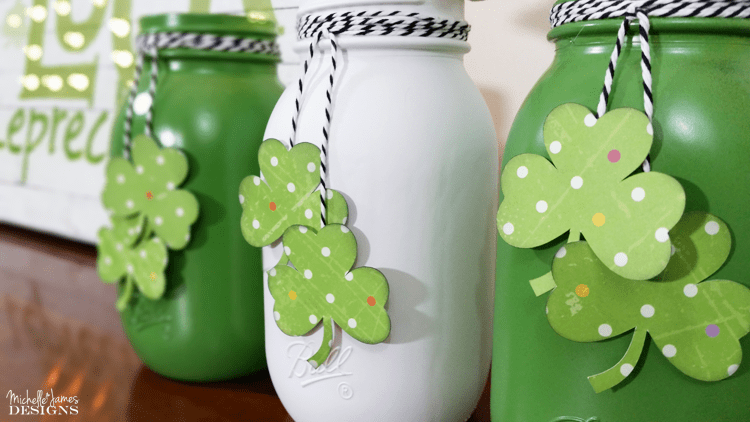 So in today’s post, I am showing you some amazing St Patrick’s Day mason jar decor projects. 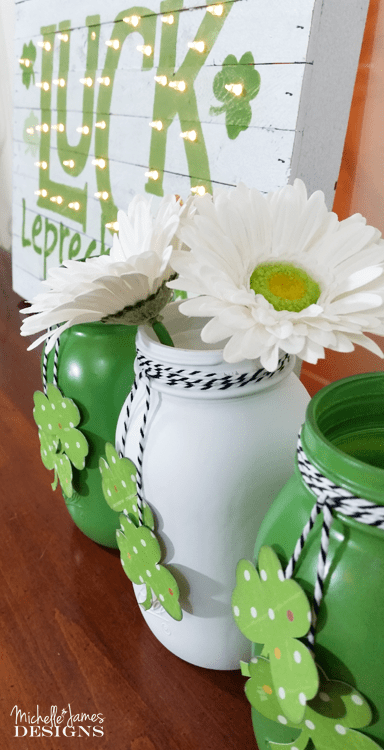 Mason jars are one of my favorite ways to decorate and are very budget friendly so you can create them for all seasons. I wanted a simple design for my mason jars. St. Pat’s decor can get pretty outrageous but I like to keep mine simple. It is a really easy project! 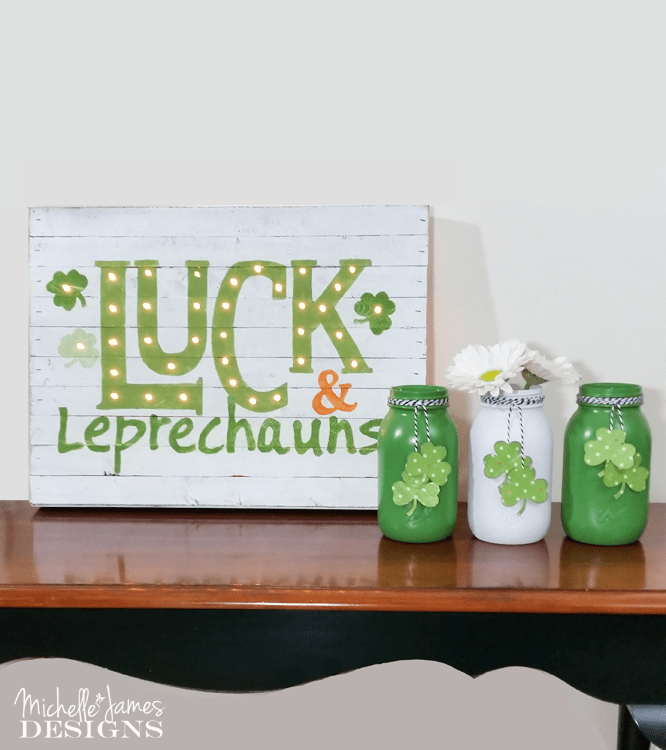 You can also see the Luck & Leprechauns Marquee Sign I made last year. I still love it! 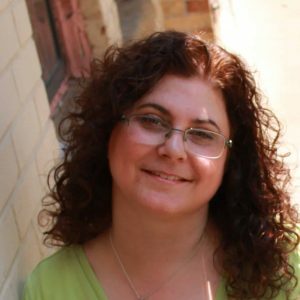 Supplies needed: I have included affiliate links for your convenience. You can read my full disclosure here. Shamrock punch or, in my case the Silhouette Machine, or even a template to cut them out. 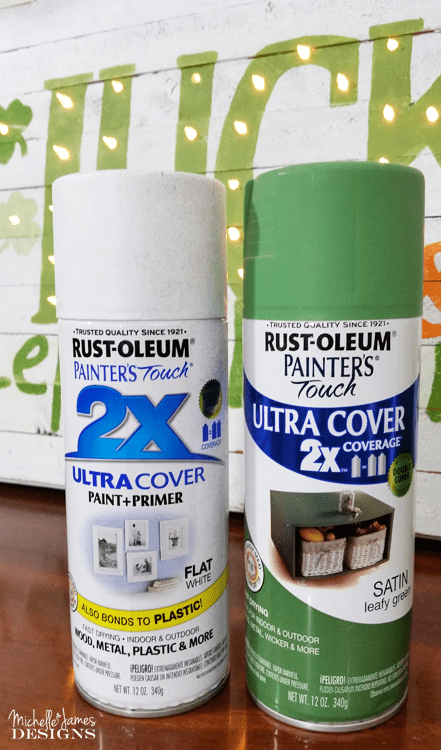 Paint two jars green and one jar white. I love the Rust Oleum spray paints and chose white and leafy green. 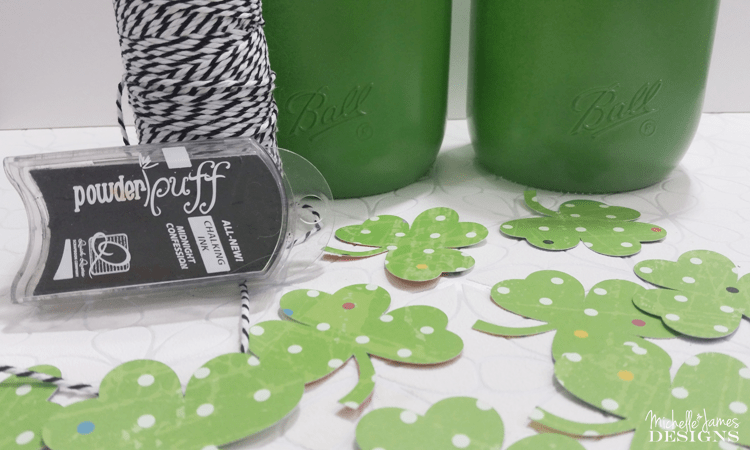 Cut out your shamrocks from pretty green (or any St Pat’s colors). 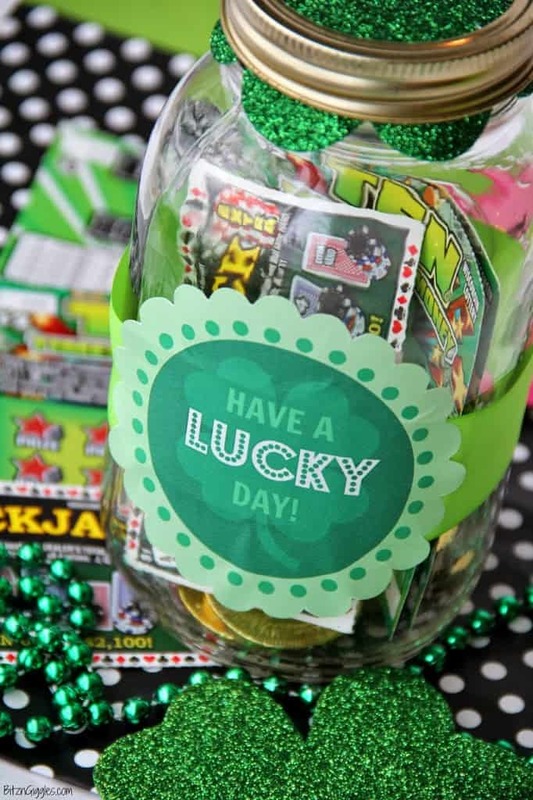 You will need four shamrocks for each jar. In order to have them fit back to back you may want to cut two of the four as a mirror image. Then they will fit together. Ink the edges of the shamrocks. I love the Powder Puff inks and this color is Midnight Confession. 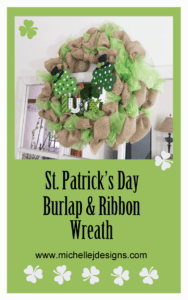 Wrap the bakers twine and and attach the shamrocks. I like to wrap the twine around the top of the jar about 4 or 5 times and tie a knot in the front. When I cut my shamrocks I wasn’t completely sure how I would be attaching them. So I did not cut any mirrored images to lay them back to back. I cut the stem off of the back shamrock and trimmed the edges a bit. They were not fitting together properly and the back side of the paper was showing. Use adhesive to attach the back to the twine. Then sandwich the twine between the front and the back. Keep going until all of the twine ties have been adorned with shamrocks. Then you are all done! Check out these fun ideas from a few different blogs. 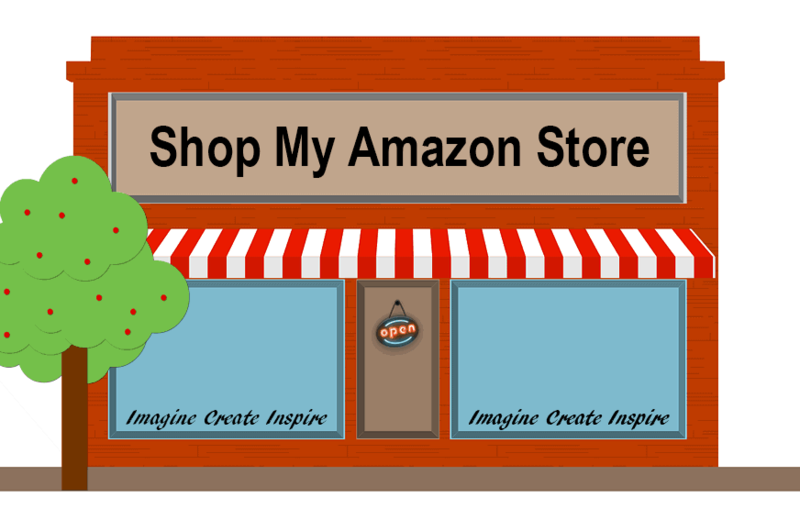 People are so creative and I love to find great decor and gifts. 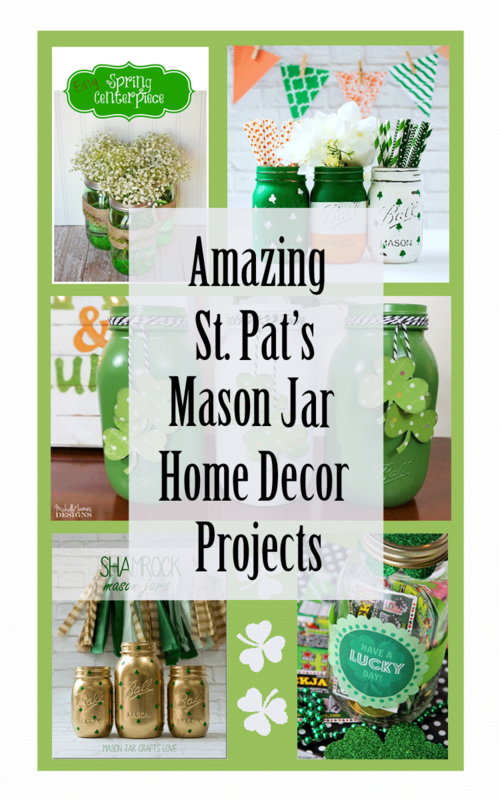 After you get done reading my post you can click on the link and read about how they made their mason jar decor. So there you go. 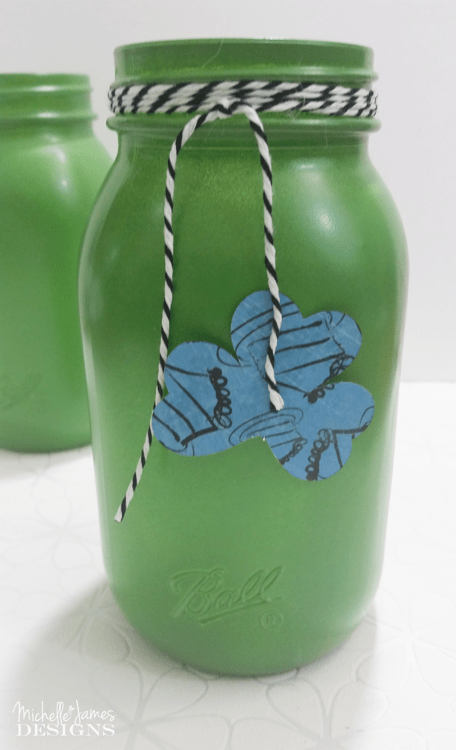 A nice way to start the upcoming holiday and get some new mason jar decor ready for your home! If you like these ideas be sure to pin it so you can find them later! Thanks so much for stopping by! 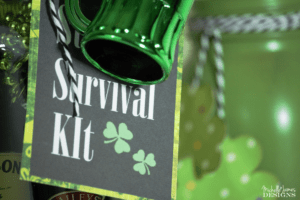 And if you enjoy St. Patrick’s Day and all the fun decor that goes with it, be sure to stop back often before now and March 17th to see more great ideas. I love your Mason Jars Michelle. They are super cute! And the others are so inspirational too! I’m making some for Mother’s day too! I just love them. What a beautiful job you did! Ooooh Mother’s Day is a great idea. I can’t wait to see them. Thanks so much for your kind words! I love simple too. These are perfect! Thanks Nancy! I do love them and they were sooooo easy! Your little town sounds like the place to be on St. Patty’s Day! 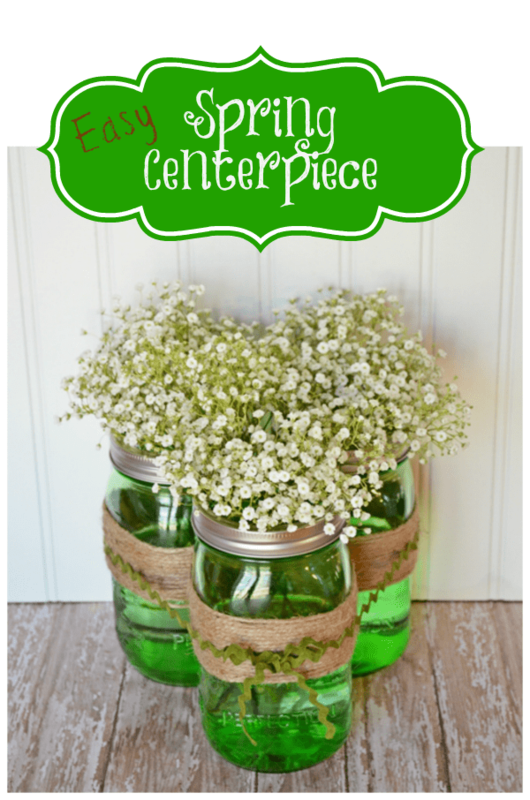 I love your Mason jar project & the other great Mason jar ideas you shared! Thanks Michelle. 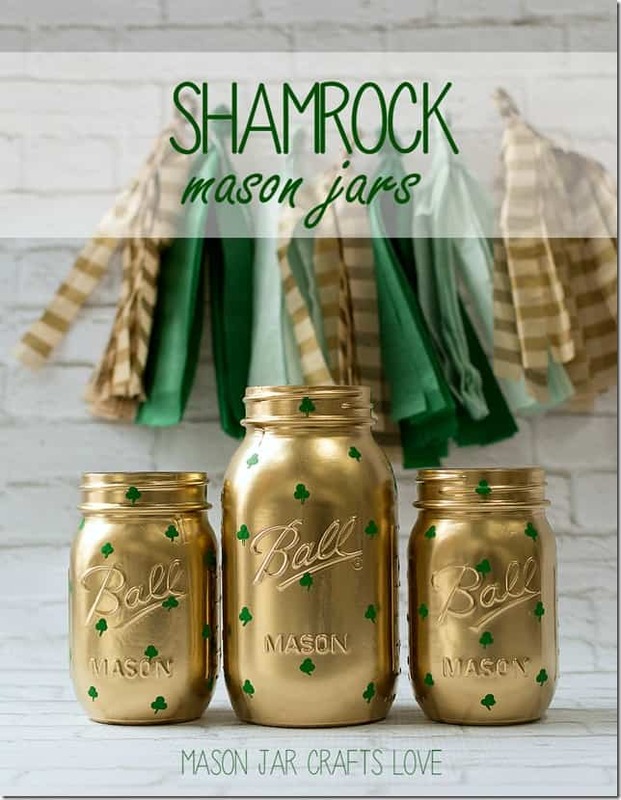 These were fun to make and are perfect for our St. Patty’s Day celebration. It is a fun week around here. Wow Michelle love all the awesome mason jars inspiration. And loved learning something new about your town. Hi Anj! I am glad you stopped by to see my new mason jars! I love them. Our little town is great but St. Pat’s is just a fun time! I am glad you liked them. Oh these jars are just the cutest ever. I love the colors you combined. Someday I hope my crafty skills wake up so I can make some of the wonderful things you have on your blog. Teerific!! Thanks so much Susie! You know there is a crafter in you just screaming to be seen and heard! LOL! I am glad you stopped by! 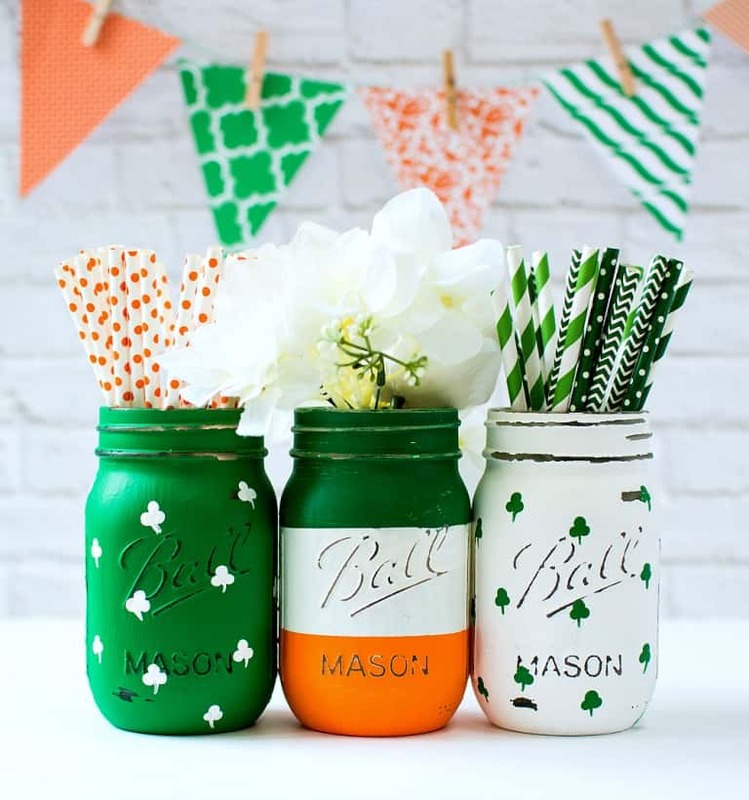 I think your mason jars are so darn cute and not simple, but exactly right. My SIL lives in an Iowa town and also a transplant. It’s not all Irish, but for some reason, these small Iowa towns are hard to move into. I love my friends and all of the people here but I do still feel like the outsider! Proud to say I know this creative lady!